How Do Medical Professionals Diagnose Anthrax? When Should I Seek Medical Care for Anthrax? What Is the Prognisis for Anthrax? Is There a Vaccine to Prevent Anthrax? The U.S. Centers for Disease Control and Prevention classifies anthrax as a Category A agent with serious bioterrorism potential. If terrorists were to use the anthrax spores, they would most likely want to disperse it into the air for mass effect. As seen in October 2001, terrorists could also deliver anthrax by other means, such as placing spores in letters or packages to be opened, inhaled, and handled by unsuspecting recipients. 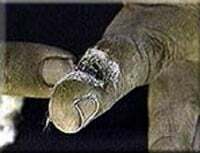 Cutaneous (skin) anthrax causes a characteristic sore on the skin and results from exposure to the spores after handling sick animals or contaminated animal wool, hair, hides, or bone meal products. It is an occupational hazard for veterinarians, farmers, and people who handle animal products. Where the bacteria are common, human infection remains uncommon. Humans are relatively resistant, but the spores may gain access through even tiny breaks in the skin. Cutaneous anthrax is easy to cure if it is treated early with appropriate antibiotics. Inhalational anthrax results from breathing anthrax spores into the lungs. People who handle animal hides infested with spores may develop inhalational anthrax, known as woolsorter's disease. Earliest symptoms resemble those of a respiratory infection such as mild fever and sore throat. Once established, the organisms multiply and may spread their toxins to the bloodstream and many other organs. Infection may spread from the liver, spleen, and kidneys back into the bloodstream, thus causing an overwhelming infection and death. This type of infection (known as septicemic anthrax) most commonly follows inhalational anthrax. Gastrointestinal anthrax results from eating meat products that contain anthrax. Gastrointestinal anthrax is difficult to diagnose. It can produce sores in the mouth and throat. A person who has eaten contaminated products may feel throat pain or have difficulty swallowing. Other symptoms can include nausea, loss of appetite, bloody diarrhea, and fever. This form of anthrax has a very high death rate. 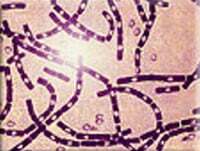 Anthrax is caused by the bacteria B. anthracis. These are rod-shaped bacteria that can change from "normal" bacteria into spores (or single-celled seeds that can reproduce the bacteria). Microscopic picture of anthrax. Image courtesy of AVIP agency, Office of the Army Surgeon General, U.S.
Cutaneous anthrax occurs one to seven days (usually two to five) after spores enter the body through breaks in the skin. This form most commonly affects the exposed areas of the arms and, to a lesser extent, the head and neck. The infection may spread throughout the body in up to 20% of untreated cases. Cutaneous anthrax begins as a small pimple-like lesion (a sore) that enlarges in 24-48 hours to form a "malignant pustule" at the site of the infection. This sore (about 2-3 cm or about an inch) is round with a raised edge. The sore is not painful. The central area of infection is surrounded by small blisters filled with bloody or clear fluid containing many bacteria. A black scab forms at the site of the sore in seven to 10 days and lasts for seven to 14 days before separating. The surrounding area may be swollen and painful and may last long after the scab forms. Sores that affect the neck may cause swelling that could affect breathing. Skin lesions of anthrax on neck. Picture courtesy of the Public Health Image Library, CDC, Atlanta, Georgia. 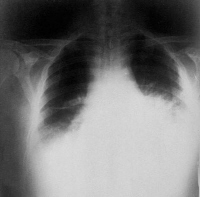 Chest X-ray showing widened chest cavity resulting from inhalation anthrax. Image courtesy of Dr. P.S. Brachman, Public Health Image Library, CDC, Atlanta, Georgia. Inhalational anthrax begins abruptly, one to 60 days (usually one to three days) after inhaling large amounts of anthrax spores. The size of the spores is extremely important when it comes to causing disease, and this depends upon the techniques of the person producing the spores. Spores that are too small are inhaled but then immediately exhaled and do not remain in the lungs to cause disease. Spores that are too large do not remain suspended in the air when released and drop to the ground and are thus never inhaled in the first place. Optimal sized spores for an anthrax biological weapon measure 1-5 micrograms in diameter. A person may initially have no specific respiratory or breathing symptoms but might have a low-grade fever, sore throat, and a nonproductive cough. An exposed person may feel chest pain early in the illness and improve temporarily before rapidly progressing to having severe breathing problems. Inhalational anthrax progresses rapidly with high fever, severe shortness of breath, rapid breathing, bluish color to the skin, a great deal of sweating, vomiting blood, and chest pain that may be so severe as to seem like a heart attack. Inhalational anthrax usually causes death when the poisonous toxins produced by the bacteria overwhelm the body systems. Swallowing spores may cause intestinal anthrax two to five days later. People with intestinal anthrax may have nausea, vomiting (also vomit blood), tiredness, no appetite, abdominal pain, and bloody diarrhea, plus a fever. Intestinal anthrax is difficult to recognize. Shock and death may occur two to five days after it begins. Swallowing of spores may result in anthrax appearing in the mouth and throat two to seven days after exposure. People with this type of anthrax may have a sore throat on one side or difficulty swallowing. Death may occur because the person's throat may swell and cause difficulty breathing. Septicemic anthrax refers to an overwhelming blood infection by anthrax. This can be a complication of inhalational anthrax. Internal organs may become darkly colored with widespread bleeding. The bacteria multiply in the blood and overwhelm the white blood cells. Most cases of septicemic anthrax occur following inhalational anthrax. The number of organisms released from the liver or spleen into the bloodstream overwhelms the body's defenses and leads to the production of massive amounts of lethal toxin that result in shock and death. This type of anthrax may complicate any form of anthrax and spread throughout the lining tissues of the central nervous system and to the brain. The skin lesions will eventually turn black. If you have a painless ulcer (sore) that is suspected to be cutaneous anthrax, the doctor will take a small sample of the fluid and see if it grows under special conditions in the laboratory. Samples will be viewed under a microscope. The anthrax bacteria will look different than other, similar organisms. If anthrax is suspected, laboratory personnel will take special care with the sample because it is considered a biohazard. Anthrax is not contagious from person to person, however, standard hospital practices of hygiene, known as universal precautions, will prevent spread from the sample to other people. If you have cutaneous anthrax and have developed a fever and other symptoms throughout your body, the doctor may test your blood for the bacteria. If the doctor thinks you may have inhalational anthrax, you will have a chest X-ray or a CT scan. Other tests may be performed, including a lumbar puncture (spinal tap). You will also be admitted to the hospital. An infectious-disease specialist may be among the doctors consulted to assist with management. Anthrax develops rapidly, so immediate medical attention is required. Go to a hospital's emergency department if you have been or think you have been exposed to spores. 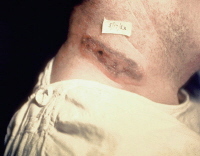 Cutaneous (skin) anthrax. Picture courtesy of AVIP agency, Office of the Army Surgeon General, U.S. Skin lesion of anthrax on face. Picture courtesy of the Public Health Image Library, CDC, Atlanta, Georgia. The preferred way to treat anthrax is with antibiotics. The goal of antibiotics is to destroy the infection and prevent complications and death. Severely ill people may be given medications through an IV. Treatment may continue for several weeks. People exposed to anthrax may be given preventive antibiotics usually to be taken for 60 days. Prognosis: If treated early, people with cutaneous anthrax recover. Those with oropharyngeal or intestinal anthrax have a less favorable outcome, and people with inhalational anthrax have the worst outcomes. About one-half of the victims of the fall 2001 anthrax attacks died. Follow-up: With cutaneous anthrax, 80% of people who are not treated will recover. If treated, they may be given medication and sent home. 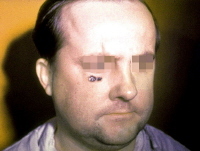 A permanent circular scar may remain at the site of the original lesion. For others, with inhalational, meningeal, or septicemic anthrax, hospitalization is required. An anthrax vaccine exists but is not readily available to the public. It is administered to people who may be expected to come in contact with anthrax, such as laboratory workers and certain military personnel. It consists of a series of five immunizations given over 18 months. A booster is then available to be given annually, especially to those who have exposure to anthrax-containing animals or animal products. A skin test can determine if the vaccine is active. To prevent infection from spores of B. anthracis released in the air after a suspected bioterrorist attack, your doctor may prescribe ciprofloxacin or doxycycline for 60 days. The vaccine can also be administered at the time of suspected exposure as a further preventive measure. Other antibiotics may be used once lab tests return showing which ones are effective. United States. Centers for Disease Control and Prevention. "Anthrax." Mar. 21, 2011. <http://www.bt.cdc.gov/agent/anthrax/>. Have you had an anthrax vaccine? Please describe your experience.